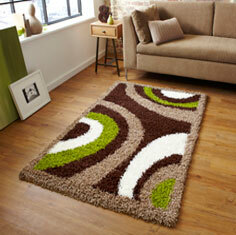 The warm, soft feeling of the luxurious, heavy pile as you walk over it is what really makes these rugs unique. All of the designs in the Vista Shaggy collection are created with tranquillity in mind, and teamed with the natural and earthy tones create a calming atmosphere in any room. If you prefer something brighter then this collection also offers a number of bold and eye-catching colours including aubergine, pink and green. Whether you have carpets or hardwood flooring in your home, you are sure to find a Vista Shaggy rug to fit perfectly in any space and because these cheap rugs such excellent value you don’t have to spend a fortune just to get a great quality rug.